New Delhi: The Rajya Sabha on Wednesday passed the Constitution (124th Amendment) Bill, 2019, to grant 10% reservation for economically weaker sections of general category with the opposition divided over its stance on the legislation. The quota bill will now become a law as the president’s nod is expected soon. 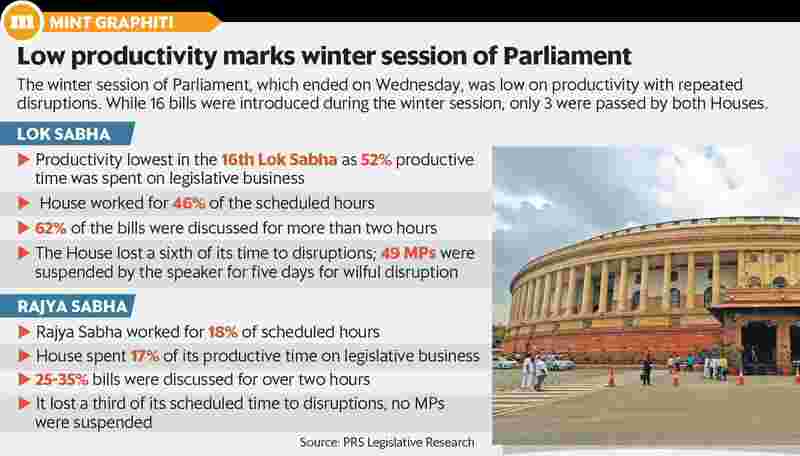 The Lok Sabha had passed the quota bill on Tuesday. In one of the swiftest movement, the quota bill got approved by the union cabinet and passed by the parliament in under 60 hours. The passage of the quota bill—and all the major opposition parties supporting it—is crucial as it comes ahead of 2019 Lok Sabha elections due by May. The immediate trigger for the bill is Bharatiya Janata Party (BJP) facing a backlash of the upper castes in the recently concluded assembly elections in Madhya Pradesh, Chhattisgarh and Rajasthan. The quota bill in Rajya Sabha was passed by 165 votes, more than two-thirds majority of the house. Seven members voted against it. While Thaawar Chand Gehlot, union minister of social justice and empowerment, tabled the quota bill in Rajya Sabha on Wednesday. It drew support of major opposition parties, including the Congress, which had only a day earlier accused the centre of trying to push the bill ahead of general elections, without any scrutiny by a select committee. “Today this house makes a historic decision. Lakhs of families that are close to the poverty line—and are forced to live life that way—will now get reservation in government jobs because of this amendment. PM Modi has introduced this bill with good intent so that people can reap the benefits of government programmes. I thank the political parties for supporting this bill," Gehlot said. The 124th Amendment Bill provides for 10% reservation to economically weaker sections in the general category, especially upper castes. “Weaker section beneficiaries" include people less than ₹ 8 lakh annually; own less than five hectares of agricultural land, residential property of less than 1,000 sq. ft and a residential plot that is less than 109 square yards in a notified municipality and 209 square yards in a non-notified municipality. Dravida Munnetra Kazhagam (DMK) leader M. Kanimozhi, opposed the quota bill, saying that it “had been forced on both houses without being sent to the standing committee or select committee". At the same time, the Congress, while supporting the bill questioned how the Centre had decided on ₹ 8 lakh as the limit, when people with incomes of ₹ 2.5 lakh and above paid income tax. “We don’t know what the hurry is. They (BJP) had five years and they could have introduced it earlier and it would have been taken to the select committee and it would’ve been discussed and then passed. There are three hurdles this bill will have to pass: complete non application of mind, second is the constitutionality of the bill and third is the implementation of the bill," said Congress leader Kapil Sibal. Union law minister Ravi Shankar Prasad told opposition parties to support to quota bill, without flogging the matter much, adding that “several big announcements are in the pipeline". The centre’s stand, however, raised opposition eyebrows with the Congress accusing it of ignoring the weaker sections for most part of its five-year term. “It took the government four years and seven months to come up with this. This was done because they got a jolt after the recent assembly elections. Has there been any focus on jobs? 97,000 jobs have been lost in the public sector undertakings. Why didn’t they bring in a women’s reservation bill? A debate could have happened on that," Congress leader Anand Sharma said in the Rajya Sabha. “We know jobs have come down and the private sector should have reservation too," union minister Ram Vilas Paswan said in response.